What if Assassin's Creed Looked More Like Star Wars? 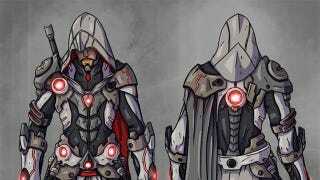 This futuristic take on what looks like Ezio, from the Assassin's Creed series, was designed by artist Davis Lim. It takes the Renaissance killer and drops him squarely in the future. Or, if you prefer, a long time ago in a galaxy far, far away. I'm getting a very "Old Republic" feel from that armour and the decorative lights, one that isn't going away when I see his weapons, which look every bit like those you'd find in BioWare's two takes on the Star Wars universe. If you're wondering how he stays hidden while lit up like a Christmas tree...maybe everybody looks like that? I'm sure if BioWare had their way even the mailmen and office admins of the future would have lighting somewhere on their clothing.